Integrity, trust and commitment are all qualities that we look for in our personal and professional relationships. It’s what makes best friends last forever and it’s what makes great businesses thrive. It’s the backbone of our health and well-being. When we see our best friend, our partners, husbands, wives, lovers…we glow. Even when that one favorite client calls, the smile widens on our face and no matter what kind of foul mood we are in, we shift! Science tells us that not only what we put into our body affects our lives, but what and how we think affects our health and quality of life as well. Before you go off on the power of positive thinking and chanting your way to euphoria; remember: we all have those days when spring water and a salad are on the dinner table, and then, there are those days when we just need a good martini and a tri-tip! Not every day is going to glow. Sometimes we are going to say some awesome inner affirmations and be grateful for our successes, and sometimes, we are going to verbally beat our heads against the wall. As business owners, we stretch our limits and push our boundaries to make a contribution to society, while earning a buck along the way. As our business ebbs and flows, we are discovering that the buck we earn is not just a weave of cotton fiber, inked in a way that somehow establishes value — there is actually something more to it. It’s more than simply virtual digits in our bank account; it’s our self-esteem and it’s our survival. I am not here to tell you what to think or how to live. We have a choice. Our choice is the cause and our experience is the effect as life unfolds before us. Within that paradigm is a vibration that manifests itself in every moment of every choice we make. Someone is going to respond to that vibration and it’s going to bring you more of what you want or what you don’t want. This sounds a little bit like Abraham-Hicks, but let’s leave the theatrics out of it and stick with the science. Dr. Masaru Emoto was a pioneer on how our thoughts affect our lives. 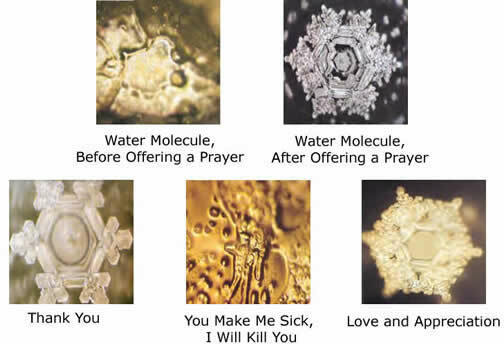 His book, The Hidden Messages in Water, clearly shows how our thoughts and emotions change the structure of water. As you can see in the picture below, upon freezing, water is affected by our thoughts and our feelings. Your body is 70% water. Now, just sit and think about that for a moment. Yes, there are some mega-millionaires who got where they are by walking a slippery slope between taking more than they gave, being honest or something else. Many got there with a combination of both. You will get there in one way or another. It’s really up to you. However, if science has anything to tell us about the path we take, one clearly outperforms the other. Every time you engage in a relationship, what kind of vibe are you sending? Either on the phone or in the written word, you are emitting something. When you follow up on leads, are you wallowing in desperation or anticipation? In short, you are one great big antenna, absorbing and transmitting signals that other antennas (a.k.a. people) are absorbing and transmitting. Believe me when I say that I am a cynic to the core. I’m also pretty irreverent when it comes to the “Aums to our enlightenment.” It’s become big business and I hope it does more good to society as a whole. Yes, I do meditate. I don’t write affirmations. I’ve had my fair share of hard times and I’m a pretty sure I’m not the only one still recovering from ‘The Great Recession.’ But I do support balance. I do understand the polarities of love and fear and I have seen more greatness accomplished in the middle, than on either the right or left of our political system. Balance includes love and fear, good and bad, success and failure. One cannot exist without the other and both will vibrate outward, into your circle of friends, family and business relationships. You are going to have bad days. You are going to get dumped on. There’s little you can to to avoid it. However, your vibe will determine how you handle the ugliness of life. It will also determine how the beauty of life will balance out those bad days. You can laugh off the crap or carry the load. A good cry helps too. Know that others will either see your humor or see the burdens on your shoulder. Too many bad days on the job and you’re going to lose business. Being overly grateful for what you have is not going to work either. You can’t push happiness. It’s annoying and disingenuous. Let it flow as you glow. It’s all good. Just remember, it’s all vibrating out to the the world, and it’s being picked up and interpreted by someone else, and hopefully in the way you intended. We all hate poor customer service. Yet, the funny thing is, I’ve had bad service when I’m in a good mood and I’ve had good service when in a foul mood. Life has a way of putting a variable into the “law of attraction,” that tends to perplex us more, especially when we thought we understood it! “Glow, like you can’t escape the rays,” is a line from a song I’m currently playing over and over and over, called Embrace by Goldroom. I know it’s kind of dorky to quote musical lyrics. In the 80s I admit to making mix tapes for my friends. In the 90s I burned and mixed CDs. Life is too awesome to not listen to all kinds of sources for inspiration. You’re brave enough to save the day.